Centipede grass originated in Southeast Asia and China. Introduced to the United States in 1916 by Frank N. Meyer, centipede grass is now widely grown in the southeastern United States. It is mainly grown along the Atlantic and Gulf of Mexico coasts where summers are warm and humid and winters are mild. Weeds are not normally a problem in centipede grass due to its allelopathic activities, which means it releases chemicals that slow down the ability of other plants to thrive next to it. However, if weeds do present a problem, an herbicidal treatment is usually all it takes to bring them back under control. Purchase a herbicide that contains the chemicals 2,4-D or MCPP. One common brand is Weed B Gon and can be found at your local home improvement store. Make sure you purchase the concentrate that hooks up to your garden hose. Screw the herbicide bottle on to the end of the garden hose. Turn on the water and position yourself on the far end of the lawn. Turn the knob on the herbicide bottle to begin dispensing the herbicide. Spray with a slow, even sweeping motion over your lawn. Work your way from the farthest point on your lawn toward your home. This will allow you to not have to walk over the sprayed area. Turn the knob on the herbicide bottle when finished spraying and then turn off the water. Unscrew the herbicide bottle; if it's completely empty discard in the trash. Herbicides should be applied during the fall and winter months. This is when the common weeds are mature and will provide the most effective kill. Keep your centipede grass healthy with frequent irrigation, adequate fertilizer, and good mowing practices. Centipede grass should be irrigated to provide 1 inch of water per week, and it should receive 1 to 2 lbs. of nitrogen per 1,000 square feet. Keep it mowed 1 1/2 to 2 inches tall. 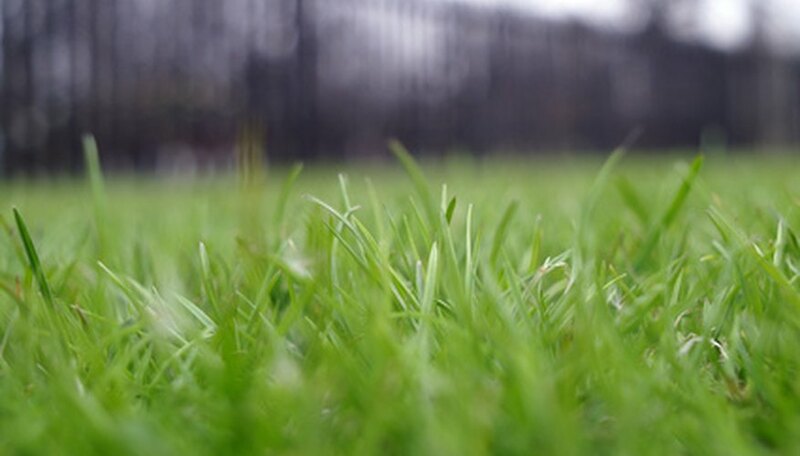 Healthy grass will be better able to keep the weeds at bay. Wear safety goggles and gloves when applying herbicide. It can be an irritant to your skin.